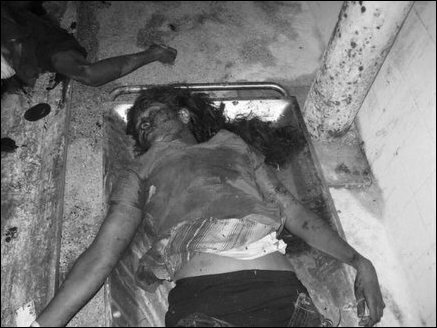 One of the five bodies recovered by the Sri Lanka Army (SLA) and transferred to Jaffna Teaching Hospital claiming to be those of LTTE fighters, after the firefight near Jaffna Fort Saturday, was identified as belonging to Krishnar Vimaleswaran (31), a watcher at Jaffna Central College, located 300 meters from where the bodies were found. Relatives identified another body as belonging to Balasingham Santhirakanthan (24) who owns a motorbike repairshop in Kottadi Jaffna. The watcher was killed inside the College compound and his body was taken to the area where firefight occurred, residents charged. Large amounts of blood stains were found inside the School premises beside the watcher's stand, sources in Jaffna said. Mr Santhirakanthan was displaced from Velani in Kayts (Jaffna Islet) and was living in Manipay, his wife and relatives told the Mallakam acting Magistrate Ms Sarojini Ilankovan when they identified the body, sources said. The yet unidentified body belonging to a woman whose body was recovered had a traditional skirt worn underneath denim trousers. Suspicion pointing to SLA attempting to indentify her as a LTTE fighter by dressing her with LTTE's denim trouser, mistaking the denims as the traditional dress of LTTE women cadre, surrounds her killing. Reports speculated that she was a civilan worker got caught in the crossfire. Further suspicions are being raised as residents close to the firefight said they heard gunshots nearly 20 to 30 minutes after the initial exchange of fire. 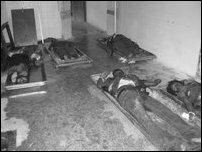 Speculation is ripe in Jaffna that the rest of the bodies may belong to Tamils arrested earlier in other parts of the district who were brought to the site and shot dead by the SLA. Krishnar Vimaleswaran, the Jaffna Central College watcher, is from Mirisuvil, Kodikamam in Thenmaradchy. His mother Mrs Krishnar Sellama (54), who identified her sons body, said that his son prepared his night meal and came to work at 4 p.m. Saturday. 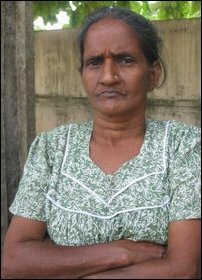 Her inquiries when her son failed to return home at the usual time of 9 a.m, led her to Jaffna Hospital, she said.